An exhibit at Philadelphia’s Mütter Museum offers a peek through a forensic pathologist’s microscope. You’ve probably never seen death this close up before. This is a piece of skin tissue from a dead body that’s been magnified 400 times, according to Marianne Hamel, a forensic pathologist based in New Jersey and Pennsylvania who photographed the image. The sample surprised Hamel when she first studied it under a microscope. While the tissue otherwise appears healthy, the dark red spots on the top left side are actually pigment granules from a red tattoo. “I knew you could see black pigments, but I didn’t realize that the colors of the tattoo would also show up microscopically,” says Hamel. 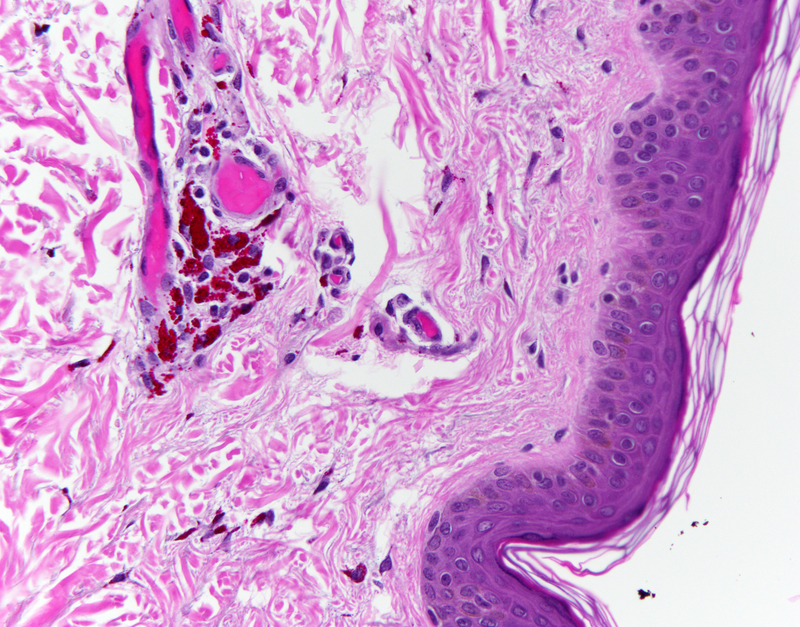 The dark purple layer on the right side of the image is the epidermis, Hamel explains. The stringy lines to the right are keratin, the thin layer that helps keep skin essentially waterproof. Everything else in pink is the dermis. Tattoos are comprised of pigment granules that are too big for the body to break up naturally and easily, according to Hamel. At the top of the image, large blobs of red pigment are trapped around blood vessels, which are the darker pink spots. When someone gets a tattoo removed, the laser treatment breaks up the pigment into smaller pieces so that the body can process and get rid of them. The image is one of 26 histological photographs captured by Hamel and forensic photographer Nikki Johnson and featured in Death Under Glass, an exhibition on display through December 16th at the Mütter Museum in Philadelphia, known for its historical medical specimens. To create a histology slide, a forensic pathologist cuts off a section of human tissue—it can be from any part of the body—that’s a centimeter by a centimeter and the thickness of a nickel. The sample is placed into a plastic cassette and covered in formaldehyde for a few days to prevent decay. It’s then sent off to a histologist, who mounts the sample in paraffin wax, cuts off a thin slice from that, and affixes the slice onto a glass slide. Finally, the histologist coverslips the slide and returns it to the pathologist, who explores the story behind the sample. “Looking under the microscope is like a whole different world,” says Hamel. A patient more than 3,000 years-old takes a turn through a CT scanner.